But where's the money going? COLUMBIA, Mo 1/5/16 (Beat Byte) -- The Columbia Public School (CPS) district has placed one of the largest property tax hikes in decades on the April ballot. But even Columbia's tax lovers -- those kind but naive souls who vote "Yes" for every hike -- are asking, "What the heck....? How much money does one school district need?" The April 2016 tax increase is 20 percent higher than a hike voters rejected in 2008, prompting the resignation of then-Superintendent Phyllis Chase. What's more, Columbia is now Missouri's highest cost of living city, after dozens of tax, rate, and fee hikes, most in the last 5-7 years. CPS alone has raised taxes every year for the past seven years. But where's the money going, skeptics ask? Even after spending $80 million on the school that looks like a penitentiary -- Battle High -- teachers aren't making more money; the school system is besieged with a hushed-up drug problem; and the quality of education is only marginally better, at best. So where is the money going? Into local banks, it seems. 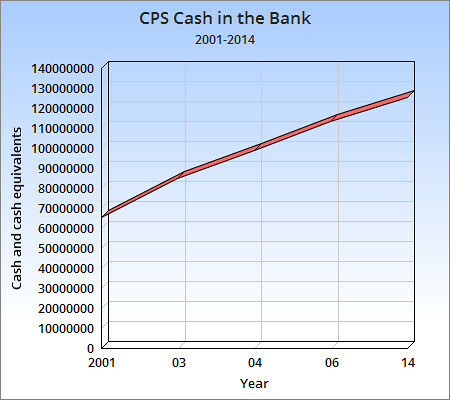 In 14 years, the district has nearly doubled how much cash it keeps on deposit, from $65 million to $125 million (Source: 2000-2014 CPS CAFR. See charts, above and below). Those figures are a great indicator that, rather than spending tax dollars on the necessities Board Members insist we need, CPS is instead building up a huge savings account. Once that money is deposited, it's available for lending to -- you guessed it -- the big developers and other high-flying types who pull the strings at all branches of local government. Just ask Landmark Bank Regional President Matt Williams. "A big part of what we do is make loans to people in the community, and Boone County government is a great source of local deposits," Williams said, after County officials announced deposits of up to $33 million in property taxes. City Hall and CPS are even larger depositers, which helps explain why Columbia's bankers back every tax hike -- and seem thick as fleas with officials like the School Superintendent and city manager. You'd think banks would oppose ways to take more money from their smaller depositers pockets. But just the opposite is true. Next up: We try to find out which local banks are holding the bucks.